In olden days, there used to be Benefit matches organized for the players who had retired after making significant contributions – those matches would be played lightly, invariably the team having the beneficiary would win. It looked much akin to an IPL match – music, dancers, fireworks, players looking relaxed .. and more. It was to be a marquee match ! The man who had coached Indians to glory – Gary Kirsten had suggested that South Africa would treat this match as a "fairly light-hearted" affair. The squad did not hold a single training session. No comparisons or analogies – the T20 no. 245 at New Wanderers, Johannersburg was marketed as a tribute to Jacques Kallis and he made mincemeat of the meek Indian bowling attack. Kallis and Ingram pulverized the attack to score 219 close to 11 runs per over. India played with 4 main bowlers – main bowler Praveen Kumar bowled 2 and gave 22; Irfan Pathan, no longer the pacer, bowled 4 and gave away 44; Vinay 32 off 3 and Ashwin 33 off 4. The long hops and donkey drops of Raina, Rohit Sharma and Kohli cost 49 off 4 ; 14 and 15 off 1 over each. Chasing a tall target, Indians did not lose any wicket and were well placed at 71 without loss in 7.5 when it rained and play called off at 8.35 pm local time (around midnight in India). Gambhir made 49 off 28 and Robin Uthappa 18 off 19 ! - Thus rain, and much difficult to understand Duckworth – Lewis ensured another loss to India. At Bridgetown, West Indies came back strongly to win the Second T20 and square the series. Windies made 160 and restricted Australians to 149 for 9, winning by 14 runs. Smith made 63, while Pollard promoted to bat at 3 made a solitary run. Brett Lee took 3 and when West Indies bowled, Marlon Samuels, Bravo and Fidel Edwards bowled well to restrict Australia and ensure a sound victory for the West Indies. This morning at Marina on the Beach Road proved to be different. Sure those of us born and bought up do not know many places in interior Tamilnadu. 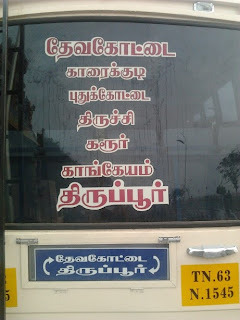 Do you know the route between Devakottai to Tirupur [DEvakottai, Karaikudi,Pudukkottai, Tiruchi, Karur, Kangeyam, Tirupur] or that a bus would ply in the route of …………. Kiranur, Lakshmananpatti, Suriyoor, Gunfactory, Navalpattu, Thiruvarambur………. The Transport system in the State is one amongst the well organized ones – still, there are places which are not served well by buses. Unlike other States, the long distance i.e., buses from District to District are run by State Govt (barring a few private transport players) and populace of the State is very much dependent on these buses. In Dec 2011, there was a news item on the announcement of Chief Minister Ms J Jayalalithaa that the State government has decided to buy 3,000 new buses at a cost of Rs 434.75 crore, to replace the old ones. The official release stated that 520 buses will be purchased in the first phase and Rs 75.36 crore has been allotted to State-owned transport corporations for the purpose. The communiqué stated that based on the Chief Minister's order, buses which are either six-year-old or which had covered a distance of seven lakh kilometer were to be replaced with the new ones. 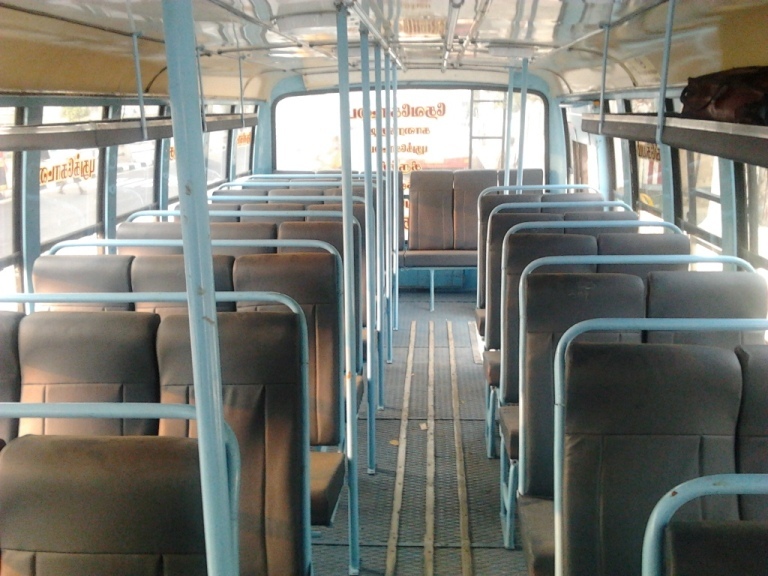 Finance Minister of Tamil Nadu, Mr. O Panneerselvam, during the presentation of Budget 2012-13 announced that the Government has envisaged the purchase of 3,000 new buses at an estimated cost of Rs 548 crore. The Tamil Nadu Lorry Owners Federation welcomed the announcement of the setting up of 13 training schools for heavy vehicle drivers in 13 districts at a cost of `13 crore. Today at Morning walkers at Marina were wondering the sight of new buses lined up throughout the entire stretch from Gandhi Statue to Labour statue. It was an impressive parade of new vehicles of various depots like Kumbakonam, Salem lined up one after the other and people stood to read the name boards and the name of places the buses would stop. It really was an interesting and encouraging sight. Understand that Chief Minister J Jayalalithaa would inaugurate the new buses at a Function to be held near Metro Transport Corporation at Pallavan Salai today. Good news for the people of Tamil Nadu indeed. …………. And now brace up for something that would affect you badly - domestic consumers are among those whose electricity tariff will go up steeply from April. The hike in the tariff ranges between 75 per cent and 110 per cent and there is not much change in the tariff revision, ordered by the Tamil Nadu Electricity Regulatory Commission (TNERC), compared to the proposal mooted by the Tamil Nadu Generation and Distribution Corporation (TANGEDCO). According to the order issued by the TNERC on Friday, subsidy to domestic consumers who consume 501 units and above in two months, has been removed totally. However, subsidy for the other categories of domestic consumers has been retained. Human rights are most important – there cannot be State sponsored terrorism – each individual’s right need to be protected. Capital punishment should be abolished. The kins of those killed in riots, terrorist bombing, murdered and raped by goons do not deserve mercy or support. The issue of Telangana statehood hitherto compounded by senseless decisions of politicians would bring Lok Sabha to a standstill for two days in the running and back in Andhra Pradesh already 2 persons have committed suicide. It was a small news item in newspapers when 2 days ago, Naxalites blew up a bus carrying CRPF jawans, killing 15 of them. In Odisha, Maoists continue to hold hostage the Italian and the MLA they kidnapped a fortnight ago – they do not deserve any care of concern. Elsewhere in the Nation which was once appreciated for a moratorium on Capital punishments, appear to have resumed executions. Japan has carried out its first executions in more than 18 months, hanging three death row inmates; Reports state that three men were hanged at prisons in Tokyo, Hiroshima and Fukuoka. They included Yasuaki Uwabe, who was convicted of killing five people at a train station in 1999. The executions are the first since July 2010; none of the 132 people on death row were executed in all of 2011, the first time a year had passed without executions for 19 years. Amnesty International Japan, accused the Democratic party of Japan (DPJ) government of reneging on an earlier promise to look seriously at its use of the death penalty. Only recently, Amnesty International had singled out Japan for praise over the absence of executions in 2011, despite evidence that successive justice ministers had come under intense pressure to sign death warrants. Prisoners are not told when they will be executed until a few hours before they are led away to the gallows, and their relatives and lawyers are informed only after the execution has been carried out. In India, some hundreds of criminals convicted by the Apex Govt still languish in prisons unsure of when and whether the executions will take place ! Ajmal Kasab after killing so many Indians lives to laugh another day. Elsewhere there is lot of turmoil in Punjab as divergent opinions and politics has ensured that Balwant Singh Rajoana is not hanged on 31 March. Amid growing pressure in favour of Rajoana, Punjab Chief Minister Parkash Singh Badal, president of Akal Takht and chief of influential Sikh body, Shiromani Gurudwara Prabandhak Committee (SGPC), informed the assembly that he was going to meet President Patil soon and seek clemency for Rajoana. Days earlier, the Superintendent had returned the death warrant issued by the Court here that said Rajoana be hanged at Patiala Central Jail on 31 March. While the SGPC has filed a mercy petition for Rajoana before the President, the CBI counsels said the Babbar militant had himself not filed any such petition and accepted his guilt. Rajoana is currently lodged in Patiala jail. The special CBI court had awarded death sentence to Rajoana and Jagtar Singh Hawara in the Beant Singh case on 1 August, 2007. Three others — Lakhwinder Singh, Gurmeet Singh and Shamsher Singh — were sentenced to life imprisonment for hatching the conspiracy to kill Beant Singh. On 31 August, 1995 as Beant Singh stepped out of his office at the high-security Punjab civil secretariat in Chandigarh, a suicide bomber blew himself up, killing the then chief minister and 17 others. Rajoana was the second human bomb to be used in case Dilawar had failed in his mission. Balwant Singh Rajoana was a police officer and was a gunman for chief minister Beant singh. On 11 September, 1993 a car bomb exploded outside the offices of the Indian Youth Congress on Raisina Road in New Delhi. The bomb used RDX as explosive, and was remote-controlled. 9 people were killed by the bomb. The primary target for the mid-day bombing was identified as Maninder Singh Bitta; Bitta survived the attack with shrapnel wounds to his chest – two of his body guards were killed. Bitta had earlier survived a bombing in Amritsar in 1992 when he lost his leg and 13 people were killed. Devinder Pal Singh Bhullar was convicted and sentenced to death for the bombing at Delhi. Bhullar's appeal against the conviction was dismissed by the Supreme Court of India on 27 December, 2006. His plea for clemency was rejected by the President of India in May 2011. In September 2011, the Supreme Court allowed Bhullar to file an unprecedented second appeal against the death sentence. Yesterday, the Supreme Court posed several queries to the government while hearing Davinder Pal Singh Bhullar's petition seeking a stay on his death sentence. In one of the queries, the court wondered as to why the government did not place Bhullar's medical records before President Pratibha Patil when she decided his mercy plea. The Govt had difficulty in defending "inordinate delay" taken to decide Bhullar's clemency petition. The Court expressed strong reservation to a foreign government writing to the Indian administration asking the latter not to execute the terrorist. ‘Loonies and toonies’ – heard this terminology for the first time today. Insurers have ‘cash in Transit’ policy also known ‘Money Insurance’ – that primarily covers the cash that is being drawn for wages, salaries and the like; money being withdrawn or taken for deposit from / to bank and business premises; business money collected by employees and the cash on the premises during business hours and being kept in ‘lockers / safes’ after office hours……… the one contemplated in this post is different – it is the ‘liquid cash’ of a high magnitude in transit ! Canadian dollar is the currency of Canada – it is amongst the most traded currencies in the World. Besides the paper money, they have coins of various denominations. The coinage is produced by the Royal Canadian Mint and denominated in Canadian dollars ($) or cents The $2 coin, carrying a polar bear, was introduced in 1996, is called by analogy the "toonie" ; Canadian $1 coin, is the "loonie". King's Highway 11, commonly referred to as Highway 11, is a provincially maintained highway in the Canadian province of Ontario. Brinks is a security and protection company popularly known for its bullet-resistant armored trucks which are used to carry money and valuable goods. They also provide security services to banks, retailers, governments, mints and jewelers. In a road accident, Millions of dollars in loonies and toonies got scattered over a section of Highway 11 and reportedly are under guard by provincial Police, north of Kirkland Lake on 27th March 2012. 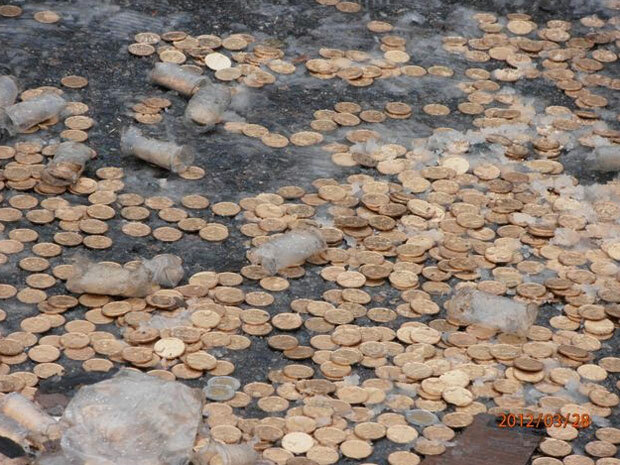 Huge amounts of coins lay scattered and reportedly, Authorities in northern Ontario are planning to use an industrial strength magnet to pick up roughly $3 million in coins. Two people were reportedly seriously injured in the accident and have been hospitalized. Newspaper reports suggest that a Brinks security truck was travelling south at 4 a.m. on Wednesday morning (28/3/12) between the communities of Ramore and Kirkland Lake when it crossed the centre line and hit a rock-face in the opposite ditch, said Const. Marc Depatie of the South Porcupine OPP. The driver and passenger from the truck were taken to nearby hospitals with life-threatening injuries. The security truck’s cargo — slightly more than $3 million in uncirculated loonies and toonies — spilled out onto the highway and surrounding area, roughly 300 kilometres north of Sudbury. In what is reported to be a multiple collision, a tractor-trailer travelling northbound then hit the security truck, which was then hit by a minivan. A third tractor-trailer, hauling candy, then smashed into the rear of the second tractor-trailer, spilling some of its load onto the road. Thus, $3 million in one and two-dollar coins with a considerable amount of confections and candy are lying scattered on the ground. After the accident, the highway was blocked in both directions; Police were on the scene to provide security for the removal of the coins and Traffic personnel have also started their investigations. Some amount could have been lost as there were unconfirmed reports of some passersby helping themselves. Immediately, lots of security was put in place and the road is not expected to be opened till the recovery operations are completed. 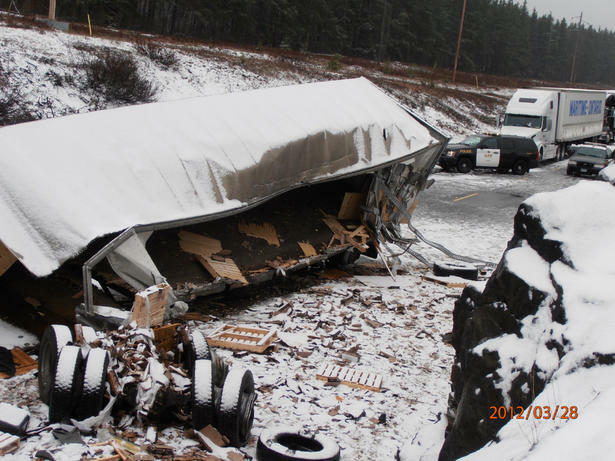 A spillage of this magnitude could not have occurred earlier and there are reports that Security firms do use tractor trailers for hauling coins intra-provincially because of the weight. How many hours you spend on the Web ? Why wear hi-heels !! Technology is to be made use of - it helps mankind, but one should never become slave to technology ! Modern day children are crazy over the internet, to many, posting on their wall, uploading photos, updating status and adding photos are the top most priorities. Then there are more of Social networking sites – even small children tweet !! such obsessive ones are called Nerds - Nerd is a derogatory slang term for a person typically described as intellectual, socially-impaired, and obsessive who spends inordinate amounts of time on unpopular, obscure, or highly technical pursuits, or relating to topics of fiction or fantasy, to the exclusion of more mainstream activities. Simply, many a times, those who spend too much time on Computers, remain in isolation and pursue technologies are known as ‘Nerds’. There are newspaper reports of a woman in Taiwan killed herself by inhaling poisonous fumes while chatting with friends on Facebook and none of them alerted authorities. The woman stated as Claire Lin killed herself on her 31st birthday, March 18, and family members who reported her suicide were unaware of the Facebook conversations that accompanied it, Taipei police is quoted as saying. Lin’s last Facebook entries show her chatting with nine friends, alerting them to her gradual asphyxiation. One picture uploaded from her mobile phone depicts a charcoal barbecue burning next to two stuffed animals. Another shows the room filled with fumes. Lin’s last words, in Chinese, were: “Too late. My room is filled with fumes. I just posted another picture. Even while I’m dying, I still want FB (Facebook). Must be FB poison. Haha.” Her FB postings reportedly indicated that she was unhappy because her boyfriend was ignoring her, and had failed to return home to be with her on her birthday. A Sociologist stated that the incident reflected social isolation in the Internet age. Today a disturbing survey in TOI states that internet users in India spend an average of 58 hours a week online; that's more than half the time they are awake. What's even more disturbing is that half the netizens interviewed admitted that they suffered from internet withdrawal within the first three hours of being cut off from the web. The report quoting Norton, the anti-virus Company as stating "Indians are spending 12.9 hours browsing, 9.7 hours socializing and 6.1 hours on email every week,". In fact, 83% of users said they couldn't live without the internet for more than 24 hours. According to Norton, the need to stay constantly connected is a new trend among Indian net surfers. The article further sates that Indian netizens clearly place a high value on their personal information and would not allow stranger full access to their computers even against hypothetical big money. Only solace is the fact that the sample size of 500 respondents is relatively low and cannot be depended upon on its entirety. The other finding was that half of them had little or no understanding of online security solutions and were mostly content with basic security. A totally unrelated news (interested me primarily because I misread the heading) You can be 5'1" and still win the Miss World contest – I misread it as ‘you can be 51 and still win the Miss World contest’ – realized my folly only in the end. It was an article featuring the interview of the Chairperson of Miss World Organisation - Julia Morley, on how the competition has evolved in the last 62 years. The Miss World contest is the oldest beauty pageant - they claim the concept of the contest to be 'beauty with a purpose'. In her own words, beauty is a superficial thing anyway. Even if you are the most beautiful in the world, you are going to get used to your face at some point. Where do you go from there? Eventually, you will get bored of your face. To a Q on why so many tall women enter the contest – she spoke of her visits to Korea and other parts of Asia where she does not see many tall women. So tallness need not be the only accepted form of beauty – she is quoted as saying ‘You can be 5'1" and still win the Miss World contest. Can Chennnai afford to host IPL matches OR Do we need them at all ?? !! Have you heard of Metal-halide ? There is clear madness and no method – not the Organisers but the fans !. On Sunday 25th Mar 2012, the counter-sales drew large crowds. People stood in long queues to get their tickets on the first day itself. The denominations of the tickets ranged from Rs.700 to Rs. 7000. Is it :- amalgamation of cricket, entertainment, money spinning or a popular time-pass for the rich in the City ? The IPL 5 Extravaganza is all set to begin in a few days from now. Starting April 4th, 2012, there would be 72 matches till May 20th; then 4 more matches to culminate the Finals of this version on 27th May 2012. The much touted game loving knowledgeable Cricket fans (!!) of Chennai are taken for another round ! - a treat of entertainment lies waiting for the ardent fans !! Bollywood diva Kareena Kapoor is all set to enthrall audiences at the opening night of Dlf Ipl 2012 in Chennai on April 3. There would more including,Amitabh Bachchan, Prabhudeva, Priyanka Chopra, Salman Khan, Colonial Cousins and Katy Perry. Yes, an American Singer, songwriter and actress - Katheryn Elizabeth Hudson better known by her stage name Katy Perry is to perform for the IPL – to promote and attract fans for the game - all set to rock at Chennai - YMCA College of Physical Education – the Board is really innovating and struggling hard to find ways to promote and popularize and patronize cricket !!! It is no pleasure but plain pain to be inside the stadium – hot days, made hotter by the lights – no facilities, one has to pass through make shift barricades and rude volunteers, no decent rest rooms, water starved toilets – nothing is allowed inside including water bottles – one needs to buy everything at exorbitant prices and when you return back, you will find more madness – everywhere – inside the stadium, finding your way out, reaching the road and finding means of transportation. Inside the stadiums loudspeakers would blare songs of all languages and there would be cacophony. This is the position and those who come to watch spending hefty amount on tickets are indeed treated shabbily ; Team India has done rather poorly in the recent tours of England, Australia as also in the Asia Cup at Bangladesh – all these would combine to keep maddening crowds away from the stadium and this IPL 5 could be trimmed to be an ordinary affair – so one thought…..
Amidst the melee, thousands of seats in the reconstructed galleries of M.A. 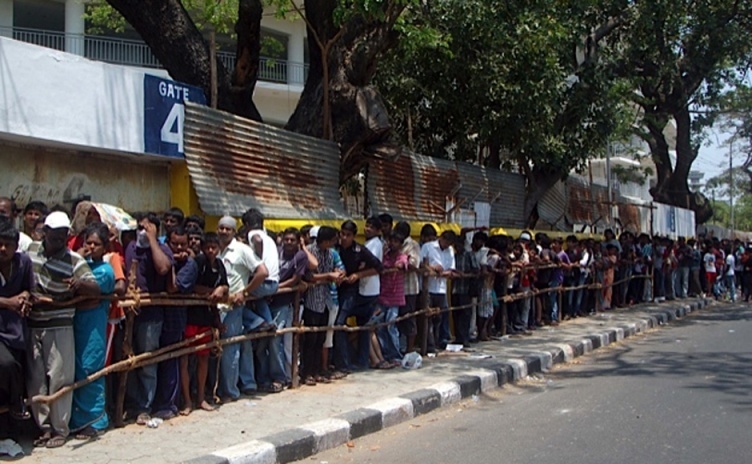 Chidambaram Stadium are likely to remain vacant this IPL season. Over 7,000 tickets for seats in the modernised galleries will be sold only after the Chennai Corporation revokes the lock-and-seal notice issued for the new structures last year. Does it smack of arrogance that they can get away with anything or really poor planning ? – there lies galleries built without building approvals from the civic body or planning permission from the Chennai Metropolitan Development Authority (CMDA). The Corporation has banned usage and remember the Champions League was played to partly empty galleries and though months have passed by, things reportedly have not changed. It is reported that the ban could be revoked only if Multi-Storey Building (MSB) panel of the CMDA gives clearance. MA Chidambaram stadium is no longer the mad concrete house – the new look stadia has reinforced concrete stands accommodating additional spectators with extra hospitality boxes. Horizontal gaps between the lower terrace and the upper stands have been provided to allow a sea breeze into the stadium from the east to facilitate swing of the ball. It has more of wire ropes and nothing of the broad round pillars that looked majestic but would distract or hide a portion from the spectator earlier. - hundred thousands of crazy chennaites would sit for long hours in front of the TV sets with airconditioners on and power consumption would jump manifold. - There would be chaos in traffic – already major parts of the artillery Anna Salai (Mount Road) have been made ‘one way’ – now hours prior to the match and hours after, buses would not allowed to ply through Bells Road causing inconvenience to all commuters. I am an ardent fan, a big lover for the game – still would it not be better to have only day games, at least in Chennai or shift all CSK games to somewhere else providing respite to the power parched citizens of Tamil Nadu. Metal Halide is the most common type of floodlight - which emits a bright white light; high pressure Sodium floodlights would emit a soft orange light, similar to that of street lights. Metal-halide lamps, a member of the high-intensity discharge (HID) family of lamps, produce high light output for their size, making them a compact, powerful, and efficient light source. Does the World Care for No. 1 Only 'All the Time' ?? The World remembers achievers and only those who are at the top – often we hear a much repeated Question – do you know or remember the man who was the second to land at Moon or the one who went to moon but did not land ? They intend pointing out that Neil Armstrong is immensely popular for the ‘one small step for a man; giant leap for mankind’ comment. Apollo 11 was the spaceflight which landed the first humans – Neil Armstrong and Edwin Aldrin Jr on Earth’s natural satellite ‘Moon’ on 20th July 1969. There was also the third man – Michael Collins – he had been to space twice – first in Gemini 10 in 1966 and later accompanying Armstrong & Aldrin in Apollo 11 as the command module pilot. He orbited the moon while the other two landed to their eternal fame ! He remains one amongst the 24 humans to have flown to Moon. You are most unlikely to have heard of or recognize Lionel Cann or Rizwan Cheema – both are cricketers !! Recently when Shahid Afridi completed 7000 runs in One Day cricket, Cricinfo had a list of players who have the fastest strike rate - there are only 11 in the list with strike rate above 100 – and some are unknown names (the qualification is 500 runs minimum though) . Afridi has 113.9 and the explosive Virender Sehwag has 104.7 strike rate – remarkable. Some important aspects that go against players from low-rung teams, is that they have to struggle all the time; play against stronger opponents and may not have many matches at their peak. The topper of the list Lionel Cann is from Bermuda – an allrounder and a specialist fielder. He no longer plays having quit the game after Bermuda failed to qualify for the 2011 World Cup. He played 26 matches scored 590 with strike rate of 117.06. The next in the list Rizwan Ahmed Cheema was born in Pakistan; played for Canada and was feared by opponents for his big hitting and six thrashing capability. now another scandal - outrage over coal scandal ! 303 years Prison Sentence for Medical fraud ? Sachin - completes the magic !! the morning beauty of Marina Beach ! Koney Video goes viral - Koney, Who ?? How do you react to Indian win at Mirpur ? Pizza market hotting up - for employment also ! Was India Pakistan Semis WC 2011 fixed ?? Do you follow World Series Hockey ?? Are Women better drivers ? Greg - your underarm stinks !! Storm spells further trouble to doomed 'MV Rena"
Sehwag dropped from Asia Cup squad ! !